Despite all appearances, Camille Saint-Saens was perhaps correct when he said that Charles Gounod would be remembered principally for his religious music. True, Gounod is currently known almost solely for his operas: Romeo and Juliet, Mireille and the marvelous Faust ... Yet the composer also wrote a considerable number of religious works: masses oratorios, motets, sacred songs as well as numerous sundry compositions in Latin, French and even English ! The composer himself explained the reasons why he felt compelled to compose sacred music in a letter to Charles Bordes: "Palestrina and Bach are church fathers for us, it is important that we remain their sons." In fact, Gounod never ceased to write sacred music, from his early days at the consevatory until his last, dying days. Like Liszt, Gounod was a devout Catholic. Also like Liszt, he was constantly torn between the spirit and the flesh, between the sacred and the profane. Berlioz, was quick to notice and praise Gounod's early composition "Agnus Dei", predicting a brilliant future for the young student at the Paris Conservatory. Winner of the Grand Prix de Rome at the early age of 21, Gounod described his youth in one word: tenderness. During his stay in Rome he assisted at the religious services at the Sistine Chapel, his first introduction - not without difficulties - to Palestrina's music. Gounod wrote: "(Palestrina's music) is strict, ascetic, horizontal, and calm like the line of the ocean"; he soon could not do without it. The composer's appetite for sacred music soon became insatiable. In Rome he wrote his first mass and an a cappela requiem which he orchestrated later. Upon his retun to Paris, Gounod became the music director at the Paroisse des Missions Chapel "on the condition", he emphasized, "that I could follow my ideas: Bach and Palestrina." 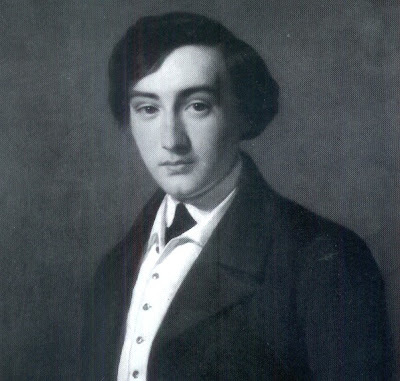 He was on the verge of being ordained (he already signed his letters "Abbé Gounod"), but, like Liszt, he was able to realize the error of his ways in time. The five years that he spent at the Paroisse des Missions taught him the virtues of a contemplative life, of meditation and prayer. In fact, Gounod composed only sacred music until 1850. In 1846 he composed a Missa brevis and O salutaris hostia for male voices for a friend; these works became the Mass no. 2 in G major, op. 1 for male chorus and organ. Dedicated to the Sociétés de Paris et du Département de la Seine, the mass was a response to the composer's deep-seated desire to restore the spirit of the liturgy in sacred music. He paly a decisive role toward reaching this goual by regularly personally directing his singers at the end of the Orphéon in Paris as of 1852. His energetic engagement was accompanied by a faith that could move mountains. 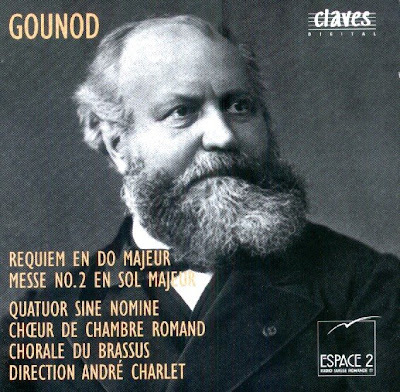 The Mass in G major already manifests the power of a higher ideal accompanied by occasional Sulpician reverences, their appearance throughout Gounod's works reflecting his times. Deeply moved by the death of his grandson Maurice, Gounod took up his pen once again in his old age. He wrote the first measures of his Requiem for soloists, chorus and orchestra on 21 March 1891 and completed the work at the beginning of 1893. The aged composer did not live to hear the Requiem's premiere during Holy Week in 1894. The work was performed again in October of the same year in a ceremony which served as a sort of official tribute in the presence of Gounod's family, representatives from politics and numerous well-known musicians including Ambroise Thomas and Giuseppe Verdi. Henri Büsser, Gounod's devoted and zealous student, prepared a number of different version of the posthumous Requiem. Büssers's last edition is the version that is used for the CD: the four soloists and chorus are accompanied by a string quartet, harp and organ. On the morning of 15 October 1893, Gounod, although feeling fatigued, went to church with his faithful companion Henri Büsser. After lunch he sat down to put the finishing touches on the piano arrangement of the exquisite Benedictus .... his wife found him with is head, "held up by his pipe resting on the table," bent over the open score of the Requiem. Gounod never regained consciousness; he died three days later on the morning of 10 October witha crucifix in his hands. The CD was released by claves digital, 1993 (DDD). Claves CD 50-9326.